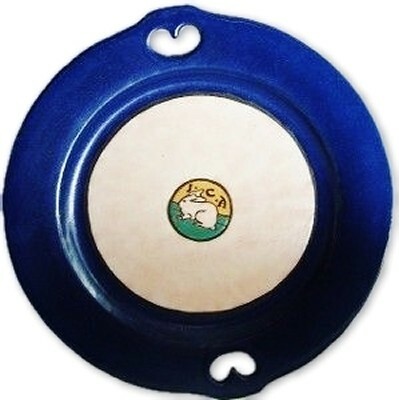 Buffalo Pottery, Deldare began in 1903 when the Larkin Soap Company of Buffalo, New York began making pottery and china to offer customers as premiums when they purchased soap products. While the soap being sold was the focus of John Durant Larkin, his brother-in-law Elbert Hubbard, who was a salesman with the company, spearheaded the marketing plan that ultimately resulted in the now famous pottery by devising a gift with purchase concept. Saturday Evening Girls (S.E.G. 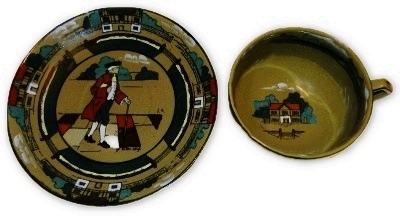 ), Paul Revere Pottery (P.R.P. ), was begun for a group of young female immigrants to help underprivileged teenage girls. They started out as the “Saturday Evening Girls Club” or S.E.G. 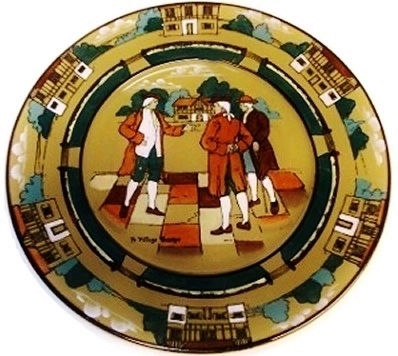 They changed their name to Paul Revere Pottery in 1908 after moving to a house located near the Old North Church where Paul Revere’s signal lanterns were placed and were later known as the “Bowl Shop”. 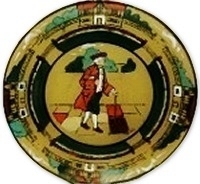 Marblehead Pottery was founded by Herbert J. Hall MD in 1904 as an out growth of a therapy program which he developed. Arthur Eugene Baggs chemist and potter was hired in 1905. He studied under Charles Fergus Binns at Alfred University. Marblehead Pottery was located in Marblehead, Massachusetts, and designed vessels there until it closed in 1936. 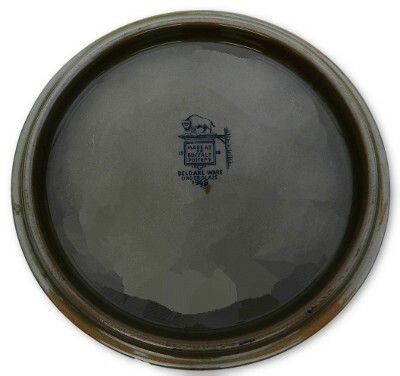 BUFFALO POTTERY DELDARE WARE "AT YE LION INN 1908" plate. Measures 6 1/4" across and is brightly and crisply decorated. 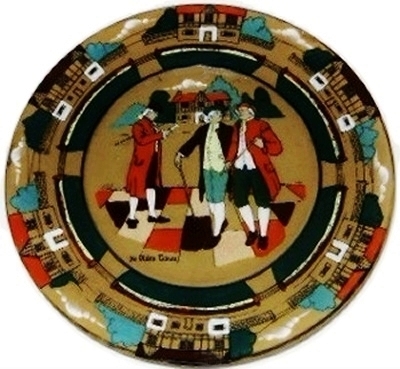 The reverse side is marked with the following; "MADE AT ye BUFFALO POTTERY DELDARE WARE UNDER GLAZE 1908 and hand painted 44 under the glaze". Wonderful decoration with crisp and clear decoration. Has a 1 1/2" craze line on the reverse side that oddly allows moisture to seep to the brown painted layer after being put into water. It shows as a small fine darker brown line that soon later completely disappears once the moisture has evaporated. 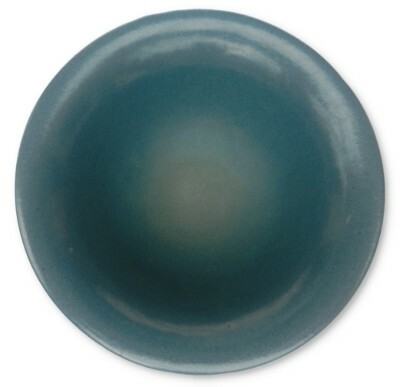 There is light crazing to the glaze and this line is definitely a craze line as it does not go through the ceramic body or go through to the front of the plate! No chips, cracks or repairs. BUFFALO POTTERY "EMERALD DELDARE" Dr. Syntax Soliloquizing 1911 7 1/4" plate. The magnificent boarder pattern surrounds the introspective scene of "Dr. Syntax Soliloquizing. Quit, my sad sir, that odious chair with your grave melancholy air". This item is in excellent condition exhibiting only normal use wear and light crazing. No chips, cracks or repairs. BUFFALO POTTERY DELDARE WARE "THE FALLOWFIELD HUNT BREAKING COVER" 1908 artist signed A.S. plate. Measures 7 1/4" across and is brightly and crisply decorated. Marked with the following; "MADE AT ye BUFFALO POTTERY DELDARE WARE UNDER GLAZE 1908" The artist signature is on the front right of the plate. No chips, cracks or repairs. BUFFALO POTTERY DELDARE WARE 8 1/4" "THE FALLOWFIELD HUNT, THE DEATH" 1909 plate. Artist initialed MAL and marked "MADE AT YE OLD BUFFALO POTTERY 1909 DELDARE WARE UNDER GLAZE 1909". 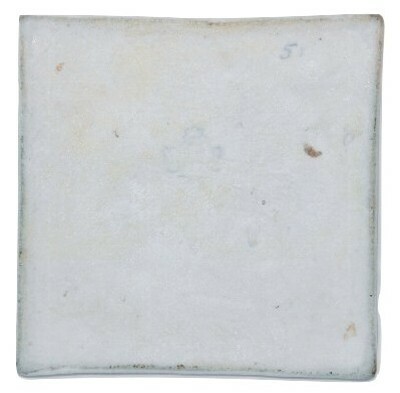 The surface of the plate has a number of very small in the making slightly raised pin sized bumps under the original glaze. No chips, cracks or repairs. 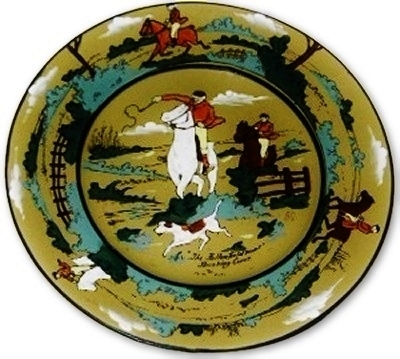 BUFFALO POTTERY DELDARE WARE 9 3/8" "THE FALLOWFIELD HUNT, THE START" 1908 plate. Artist Signed "N. Sheehan" and marked "MADE AT YE OLD BUFFALO POTTERY 1908 DELDARE WARE UNDER GLAZE 1908". The surface displays only the lightest amount of use wear and very fine crazing. No chips, cracks or repairs. 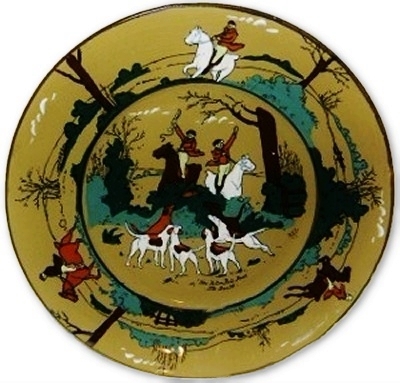 BUFFALO POTTERY DELDARE WARE 9 1/2" "THE FALLOWFIELD HUNT, THE START" 1908 plate. Artist initialed LWH and marked "MADE AT YE OLD BUFFALO POTTERY 1908 DELDARE WARE UNDER GLAZE 190". No chips, cracks or repairs. EXTREMELY RARE BUFFALO POTTERY LUNE WARE FALLOWFIELD HUNT THE START 9 3/8" Artist Signed FOZTER 9 3/8" plate. 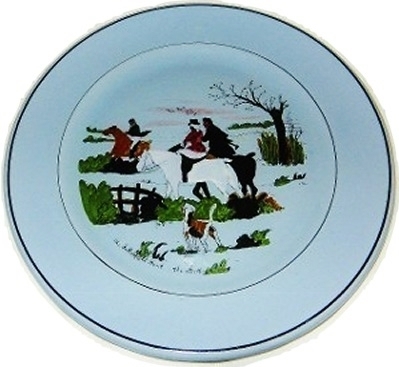 Decorated LUNE WARE with the scenes from The Fallowfield Hunt is among the most difficult and desirable items by Buffalo Pottery you will have the opportunity to own. 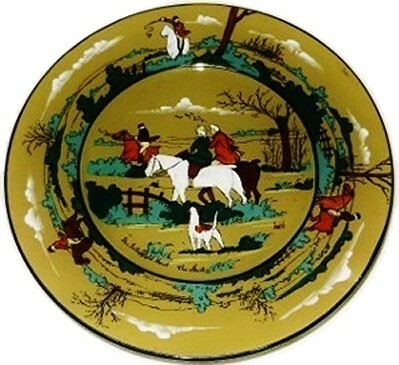 This item has the traditional decoration representing "The Fallowfield Hunt" and "THE START" scene. A very small artist mark is almost hidden in a bush to the left of the central scene and the name Fozter can barely be made out. 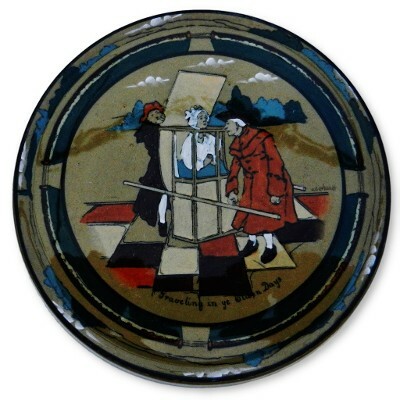 The reverse side of this fantastic item has a very indistinct Buffalo Pottery Lune Ware under glaze mark. The mark is not legible by any means though it is fully verified as being correct. This item has only very light wear and it appears to have no crazing, chips, cracks or repairs. 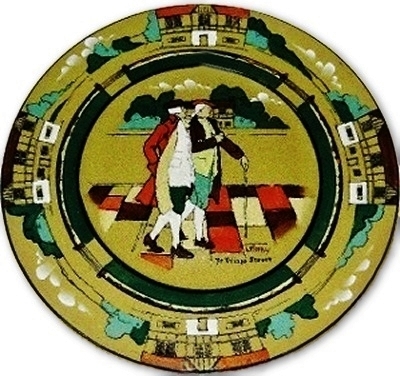 BUFFALO POTTERY DELDARE WARE "TRAVELING IN YE OLDEN DAYS" Artist Signed M. Gerhardt 1908 tea tile trivet. Measures 6 1/2" X 5/8". Marked "MADE AT YE OLD BUFFALO POTTERY 1908 DELDARE WARE UNDER GLAZE 1908". 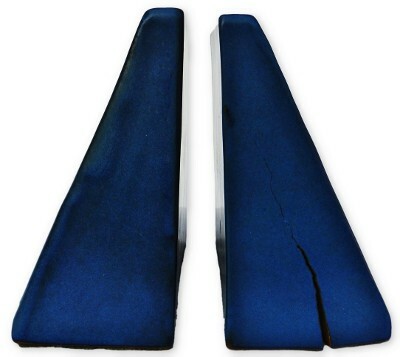 Shows surface signs of wear scuffs and use. No chips, cracks or repairs. SCARCE BUFFALO POTTERY DELDARE "VILLAGE LIFE" 5 piece tea set. This set has very light fine crazing and just one extremely tiny flea bite size glaze flake on the underside of the tea pot lid inset. The covered teapot, covered handled sugar and handled creamer, all marked with the same artist cipher. Marked with the Buffalo Pottery under glaze Deldare Ware stamp. Covered teapot measures 7 1/4" X 4 7/8", covered sugar measures 5 3/8" X 4 3/8" and the creamer measures 4 1/2" X 2 5/8". Other than the noted minuscule glaze flea bite there are no chips, cracks or repairs. 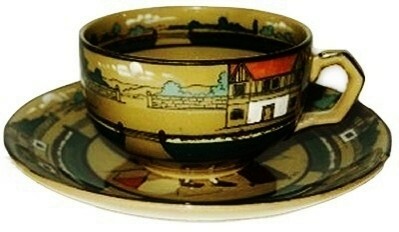 BUFFALO POTTERY 1909 DELDARE YE OLDEN DAYS' artist signed cup and saucer. 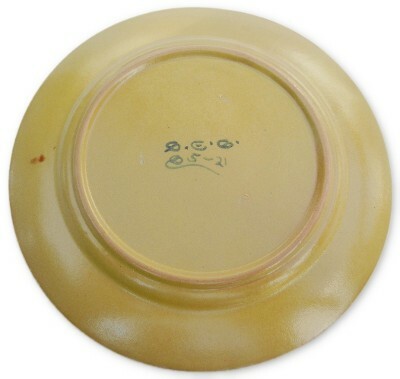 The saucer measures 6" across and sits 3/4" high while the cup measures 4 1/4" across to the outside of the handle X 2" X 3 1/2". The artist initials DS are hand painted on the saucer. Both items are marked on the underside "Made at Ye Buffalo Pottery 1909 Deldare Ware under glaze". There is only minor light crazing in small areas and no chips, cracks or repairs. 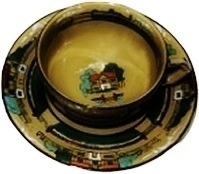 BUFFALO POTTERY 1909 DELDARE YE OLDEN DAYS' artist signed cup and saucer. The saucer measures 6" across and sits 3/4" high while the cup measures 4 1/4" across to the outside of the handle X 2" X 3 1/2". 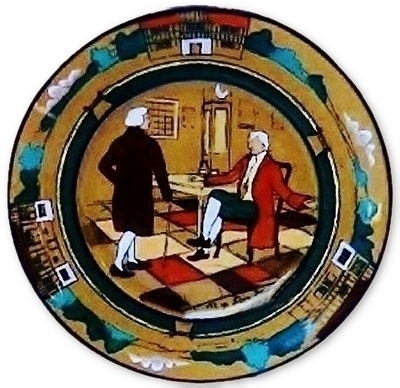 The artist initials SM are hand painted on the saucer. Both items are marked on the underside "Made at Ye Buffalo Pottery 1909 Deldare Ware under glaze". There is only minor light crazing, no chips, cracks or repairs. 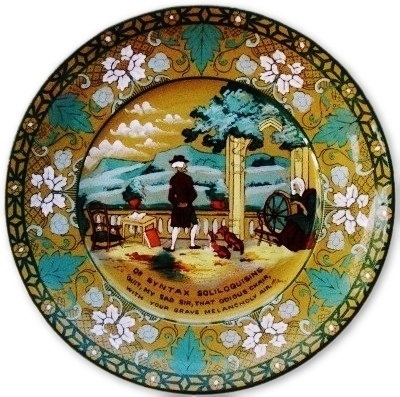 BUFFALO POTTERY DELDARE WARE 9 3/8" "YE OLDEN TIMES" 1909 plate. Artist signed "W. Fozter" and marked "MADE AT YE OLD BUFFALO POTTERY 1909 DELDARE WARE UNDER GLAZE 1909". No chips, cracks or repairs. BUFFALO POTTERY DELDARE WARE 9 1/2" "YE OLDEN TIMES" 1909 plate. Artist signed "A SLATER" and marked "MADE AT YE OLD BUFFALO POTTERY 1909 DELDARE WARE UNDER GLAZE 1909". No chips, cracks or repairs. BUFFALO POTTERY DELDARE WARE 9 1/2" "YE OLDEN TIMES" 1909 plate. 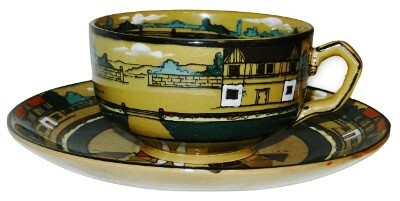 Artist signed and marked "MADE AT YE OLD BUFFALO POTTERY 1909 DELDARE WARE UNDER GLAZE 1909". No chips, cracks or repairs. BUFFALO POTTERY DELDARE WARE 9 1/2" "YE OLDEN TIMES" 1909 plate. Artist signed and marked "MADE AT YE OLD BUFFALO POTTERY 1909 DELDARE WARE UNDER GLAZE 1909". 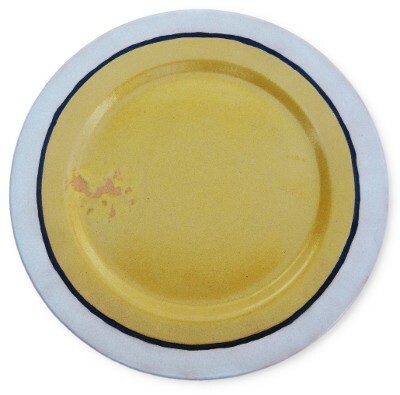 There is one tiny glaze flea bite flake on the edge of the plate which is extremely difficult to see. No other chips, cracks or repairs. BUFFALO POTTERY DELDARE WARE "Ye Town Crier" Artist signed K. Reid 1908 plate. Measures 8 1/4" across and is brightly and crisply decorated. Marked "MADE AT ye BUFFALO POTTERY 1908 DELDARE WARE UNDER GLAZE 1908" The artist signature K. Reid is on the front right of the plate next to the maid in blue and white. Normal light overall fine crazing is present, No chips, cracks or repairs. BUFFALO POTTERY DELDARE WARE "Ye Town Crier" Artist initialed 1908 plate. Measures 8 1/4" across and is brightly and crisply decorated. 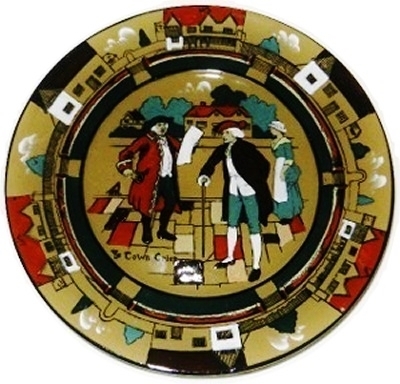 Marked "MADE AT ye BUFFALO POTTERY 1908 DELDARE WARE UNDER GLAZE 1908" The artist signature is on the front, left of the Town Crier. Normal light overall fine crazing is present, No chips, cracks or repairs. BUFFALO POTTERY DELDARE WARE "Ye Town Crier" Artist initialed 1909 plate. Measures 8 1/2" across and is brightly and crisply decorated. Marked"MADE AT ye BUFFALO POTTERY 1909 DELDARE WARE UNDER GLAZE 1909" The artist signature is on the front, and appears to be HAL in a triangular form. Normal light overall fine crazing present. No chips, cracks or repairs. 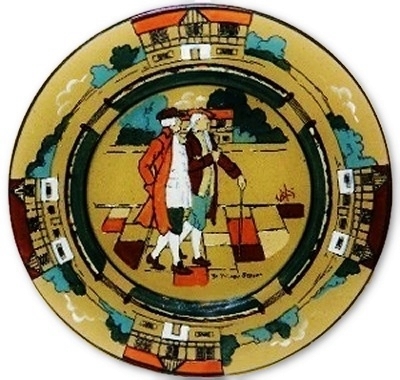 BUFFALO POTTERY DELDARE WARE 10" "YE VILLAGE GOSSIP" 1909 plate. Signed "N. Sheehan" and marked "MADE AT YE OLD BUFFALO POTTERY 1909 DELDARE WARE UNDER GLAZE 1909". No chips, cracks or repairs. BUFFALO POTTERY DELDARE WARE "Ye Village Street" 1908 artists Signed L. Palmer plate. The word Street in the title is cut short after the R. Measures 7 1/4" across and is brightly and crisply decorated. Marked "MADE AT ye BUFFALO POTTERY DELDARE WARE UNDER GLAZE 1908" The artist signature is on the front right of the plate. Wonderful decoration with exceptionally crisp and clear artist decoration. This example is in outstanding condition! No chips, cracks or repairs. 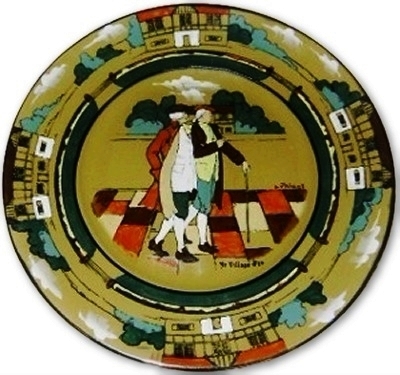 BUFFALO POTTERY DELDARE WARE "Ye Village Street" 1909 artists Signed L. Newman plate. 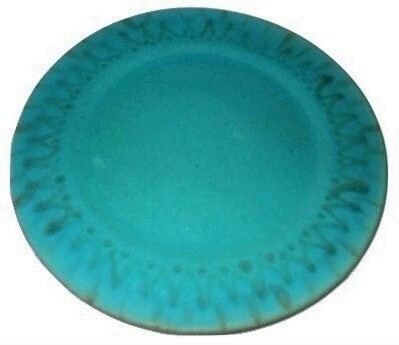 Measures 7 1/4" across and is brightly and crisply decorated. Marked "MADE AT ye BUFFALO POTTERY DELDARE WARE UNDER GLAZE 1909". Wonderful decoration with exceptionally crisp and clear artist decoration. This example is in outstanding condition with normal use wear and fine crazing No chips, cracks or repairs. 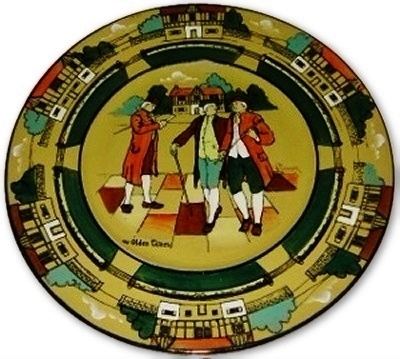 BUFFALO POTTERY DELDARE WARE "Ye Village Street" Artist signed plate. 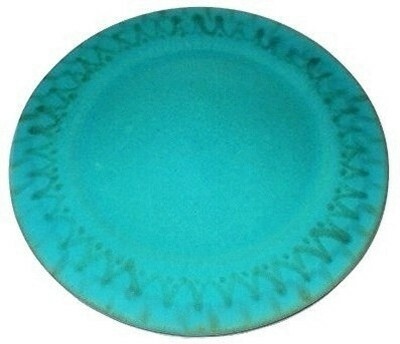 Measures 7 1/4" across and is brightly and crisply decorated. Marked "MADE AT ye BUFFALO POTTERY DELDARE WARE UNDER GLAZE" The artist signature is on the front right of the plate. Wonderful decoration with exceptionally crisp and clear artist decoration. This example is in outstanding condition and has NO CRAZING! No chips, cracks or repairs. 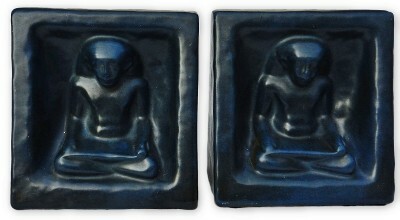 MARBLEHEAD POTTERY signed pair of Egyptian figure matte blue bookends. 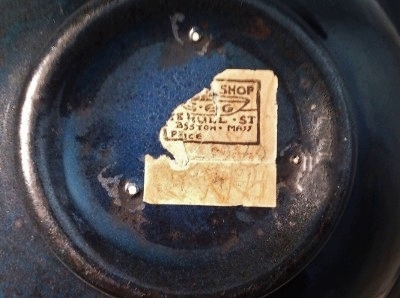 Each item has its original oval MARBLEHEAD POTTERY paper label intact. One bookend also has its original felt pad on the bottom while the other is missing the felt. Measures 5 3/4" X 5 1/2" X 2 1/2". No chips, cracks or repairs. MARBLEHEAD POTTERY 3 handled hanging basket. 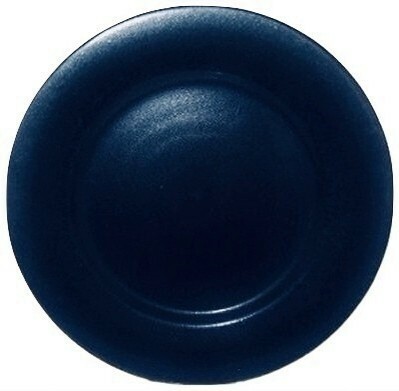 Covered in a beautiful dark blue matte glaze. There are some areas where there is glaze crawl allowing the red clay body to show. This is original to the manufacturing process and not damage. 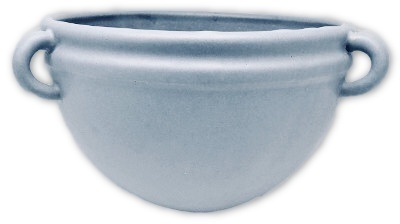 A well documented MARBLEHEAD POTTERY shape which is unsigned as is normally found. Measures 5 1/2" X 3 1/2". No chips, cracks or repairs. MARBLEHEAD POTTERY 3 handled hanging basket. Covered in a beautiful grey matte glaze. 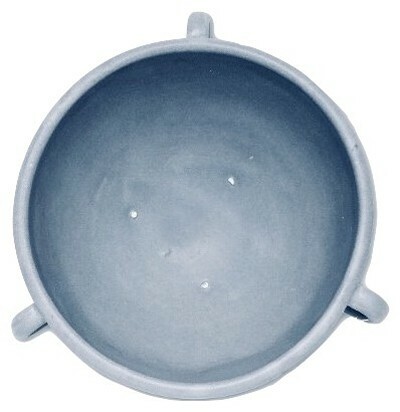 A well documented MARBLEHEAD POTTERY shape which is unsigned as is normally found. Measures 81/4" X 4 1/2". No chips, cracks or repairs. 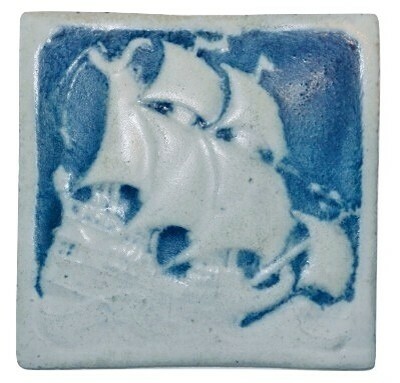 MARBLEHEAD POTTERY matte, blue, and white decorated sailing ship tile. This example appears to have never been mounted and has a very light warp to the extremely clean and damage free tile. Impressed with a lightly blue filled MP and sailing ship mark along with a hand incised #51. Measures 4 1/2" X 4 1/2" X1/4". No chips, cracks or repairs. MARBLEHEAD POTTERY matte glaze green corset shape vase. The base is impressed with the MP and square rigged sailing ship mark (somewhat filled with glaze but clearly recognizable). Standing 4 5/8" tall, measuring 2 1/8" across the base and the top rim measures 1 7/8" across. No chips, cracks or repairs. MARBLEHEAD matte lavender glaze vase. 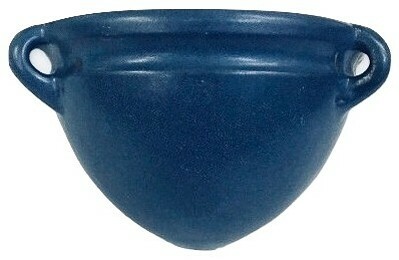 Has a slight lean to the bud vase section from the manufacturing process. A very faint MP and square rigged sailing ship mark. Measures 6" tall and 2 7/8" across the base. No chips, cracks or repairs. 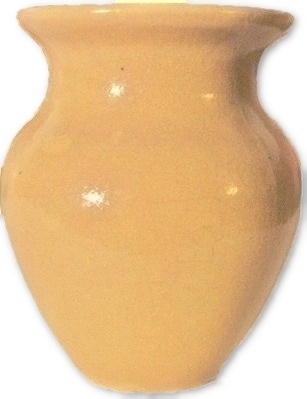 MARBLEHEAD POTTERY matte mauve glaze corset shape vase. Impressed with the MP and square rigged sailing ship mark and it's original oval paper label. Standing 4 1/2" tall, measuring 2 1/4" across the base and the top rim measures 1 3/4" across. No chips, cracks or repairs. 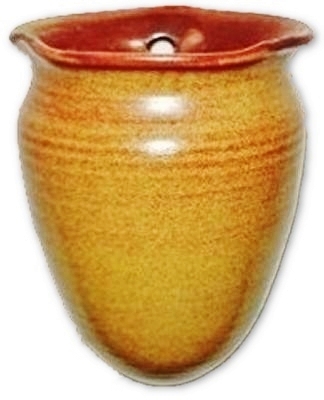 MARBLEHEAD POTTERY ribbed beehive shaped brown wall pocket. Measures 5 1/4" X 3 3/4" X 3 1/2". Impressed MP with square rigged sailing ship mark. No chips, cracks or repairs. 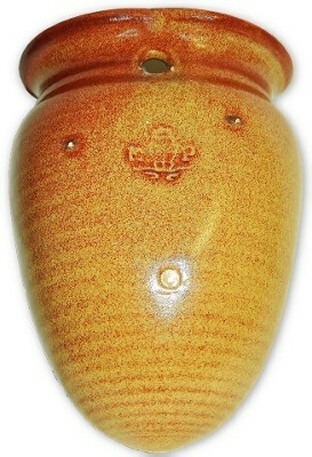 MARBLEHEAD POTTERY beehive shaped brown wall pocket. Measures 4 3/4" X 3 7/8" X 3 1/2". Impressed MP with square rigged sailing ship mark. Has a small amount of glaze wear inside the hanging hole opening and shows 3 tiny stilt mark dots from the glazing process. No chips, cracks or repairs. 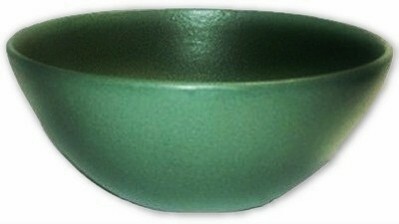 PAUL REVERE POTTERY "PRP" 5 1/2" X 2 1/4" matte green bowl. 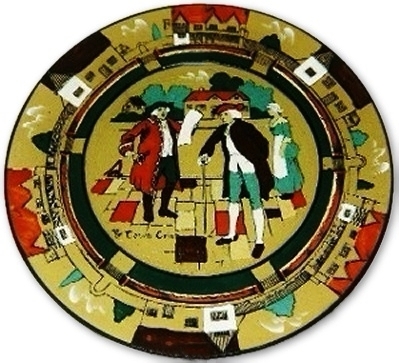 The bowl is marked with the large circular image of Paul Revere on horse back and the words Paul Revere. 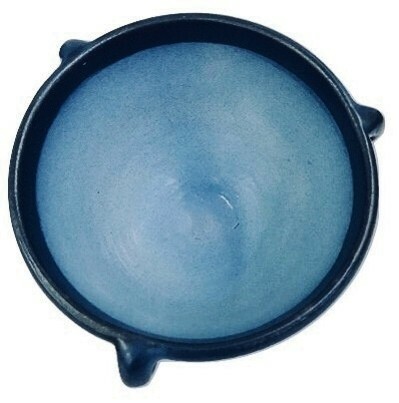 There are 2 bowls available, all are in excellent original factory condition with no crazing and normal small factory anomalies and have some minor factory edge glaze skipping and thinning. No chips, cracks or repairs. 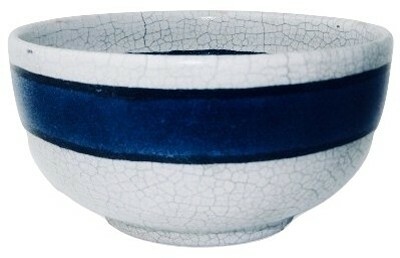 PAUL REVERE POTTERY "PRP" 5 1/4" X 2" bowl. 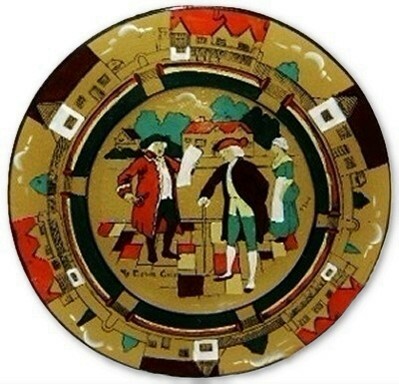 Marked P.R.P for Paul Revere Pottery underglaze. Sits on 3 small feet. 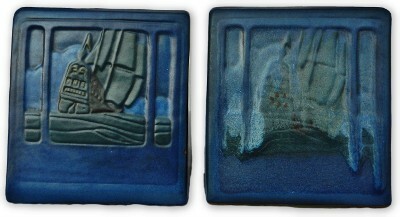 The blue glaze drips over a tan ground color and is ivory on the exterior. No chips, cracks or repairs. PAUL REVERE POTTERY "PRP" artist signed and decorated hand incised bowl. Inscribed HER-BOWL between 3 florrettes and then inscribed SARAH-LOUISE. Measures 6" X 1 1/2". No chips, cracks or repairs. 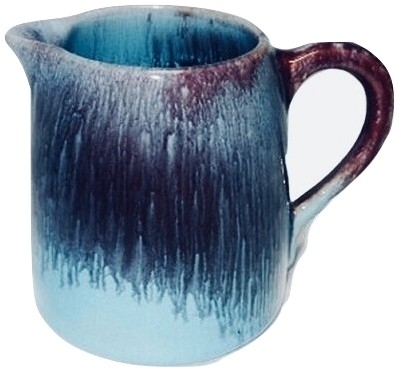 PAUL REVERE POTTERY mauve over turquoise drip glaze creamer pitcher. Marked on the bottom PRP under glaze. The reverse side of the pitcher shows more turquoise color than the side we show with the mauve drip. Measures 4" X 3" X 2 3/4". No chips, cracks or repairs. 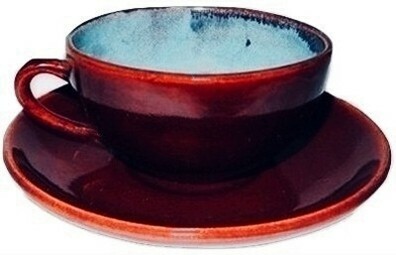 PAUL REVERE POTTERY (PRP) 8-40 burgundy and turquoise high gloss glaze cup and saucer. 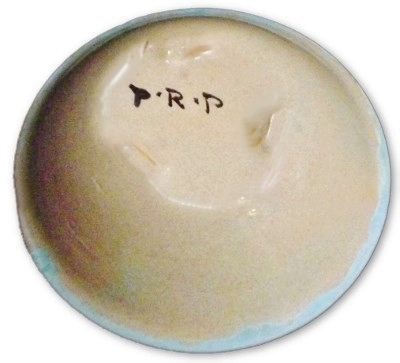 The cup is marked PRP under glaze while the saucer is marked PRP under the glaze as well as being hand incised SA and JAJ. 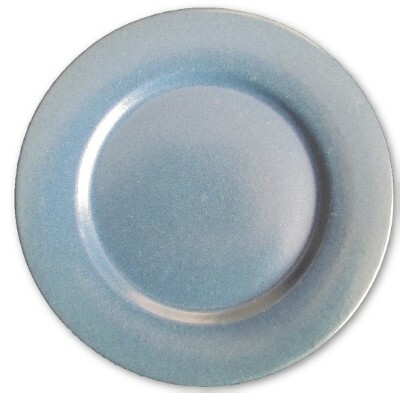 The saucer measures 5 1/2" across while the cup measures 3 1/2" X 2". No chips, cracks or repairs. 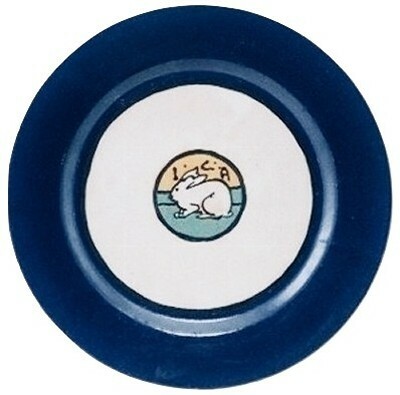 PAUL REVERE POTTERY (PRP) artist signed PRP (cipher) 3-37 slate blue plate. Measures 7 1/2" X 3/4". We have 2 plates available for purchase. No chips, cracks or repairs. 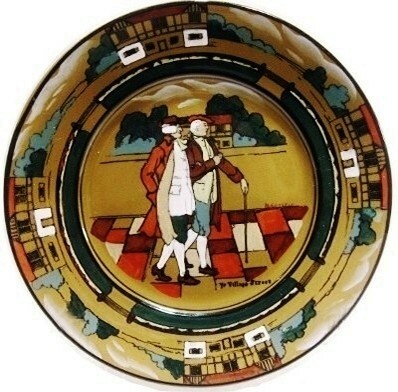 PAUL REVERE POTTERY (PRP) artist signed PRP JHW 12-26 grey plate. Measures 7 1/2" X 3/4". No chips, cracks or repairs. 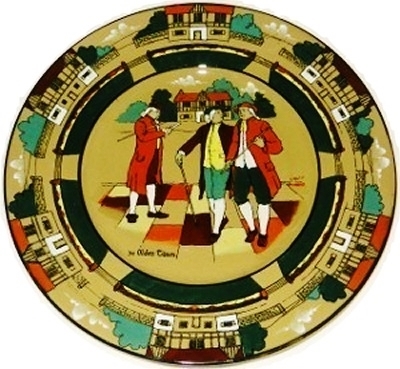 PAUL REVERE POTTERY (P.R.P.) 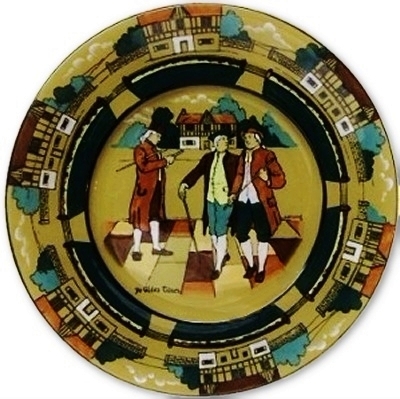 artist decorated plate with under glaze rickrack design. Measures 9 1/2" across. The reverse side is marked P.R.P. withing a rectangle and the artist cipher of an X in a Square. 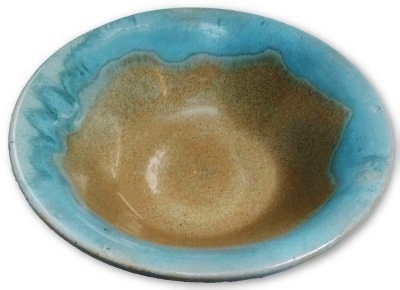 The very unusual turquoise glaze is in excellent condition with only the smallest manufacturers flaws. No chips, cracks or repairs. 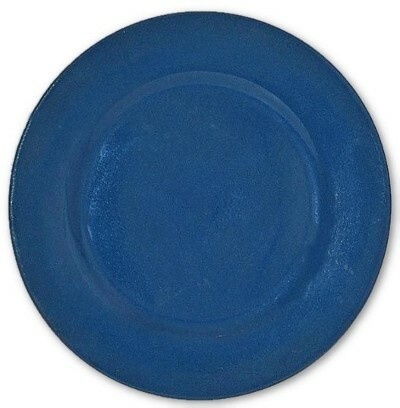 PAUL REVERE POTTERY (PRP) artist signed and dated PRP JHW 12-26 matte blue 9 7/8" plate. No chips, cracks or repairs. 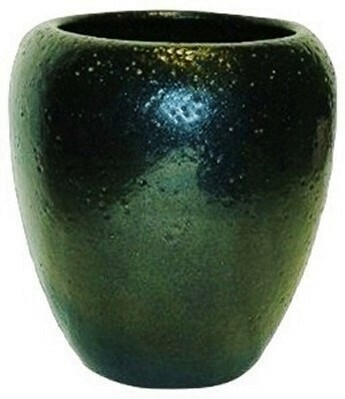 PAUL REVERE POTTERY artist initialed/marked textured volcanic type black glazed vase. Stands 4 3/4" tall and 4 1/2" across at the widest point. 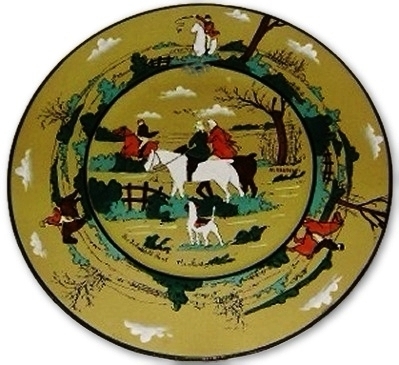 The base is impressed with the circular PAUL REVERE rider upon horseback mark. There is a very difficult to discern artist signature/cipher. No chips, cracks or repairs. 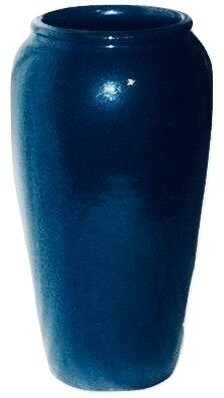 PAUL REVERE POTTERY (PRP) glossy dark blue arts & crafts 9" tall X 4 3/4" wide vase. Has 3 factory stilt grinding marks on the underside which is not damage. Impressed rider mark. No chips, cracks or repairs. 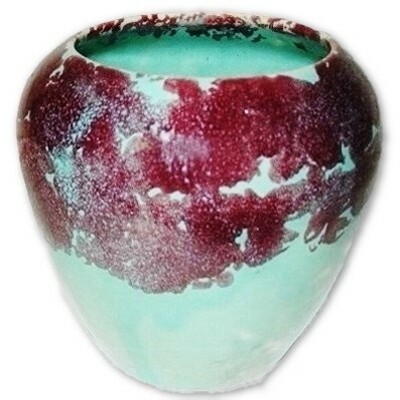 PAUL REVERE POTTERY burgundy over turquoise drip glaze vase. Marked on the bottom PRP and the Paul Revere paper label. Measures 4" X 4 1/4". There is a possible extremely tiny hairline on the rim or a scratch. It is so small and tight that I can not even see it, it is only felt with a fingernail being run around the rim. It does not show to extend into the vase. No chips or repairs. 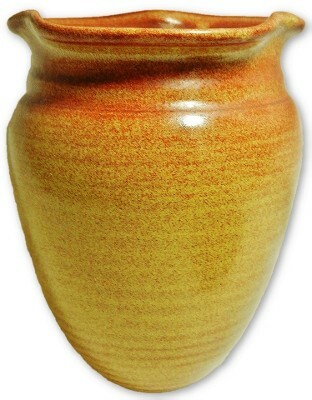 PAUL REVERE POTTERY (PRP) glossy mustard yellow 4" tall vase. Has light crazing overall yet on the underside, the crazing has darkened and shows one craze line that runs across the bottom of the vase. No chips, cracks or repairs. S.E.G. 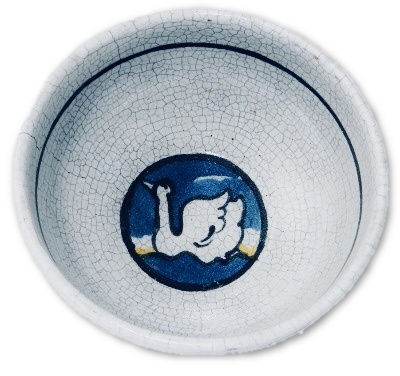 SATURDAY EVENING GIRLS hand decorated small bowl with the image of a white swan on blue with blue, black and white ground. Measures 4 1/2" across and stands 1 7/8" high. Marked 10-20 S.E.G. LM in a rectangle. There is overall crazing and a 2" long darkened craze line which appears to have become a hairline crack along with another shorter darkened line which appears to be solid and on the interior rim only. This item will be offered as an as/is special. No other chips, cracks or repairs. S.E.G. SATURDAY EVENING GIRLS buttercup yellow matte bowl by LILI SHAPIRO. Measures 4 3/4" across and stands 1 1/2" high. Marked 590-6-10 S.E.G. LS in a rectangle. No chips, cracks or repairs. SATURDAY EVENING GIRLS (SEG) artist signed and dated blue bowl by EVA GENECO. Marked on the SEG 5-22 01 EG. Measures 5" X 2" and is in pristine factory original condition. No chips, cracks or repairs. 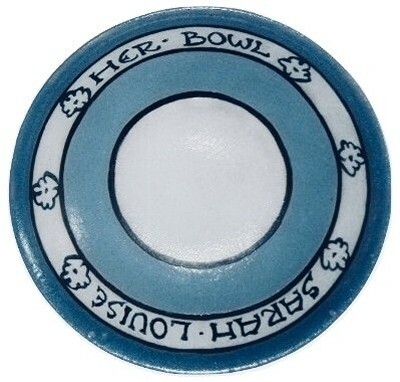 SATURDAY EVENING GIRLS (SEG) artist signed and dated ROSE CASSASSA blue rolled edge bowl. Measures 8 1/2" X 2". 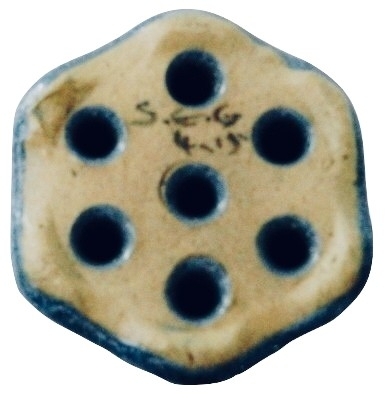 Marked SEG RC ciphers of Rose Cassassa and dated 7-23. This item is in excellent original factory condition. No chips, cracks or repairs. S.E.G. 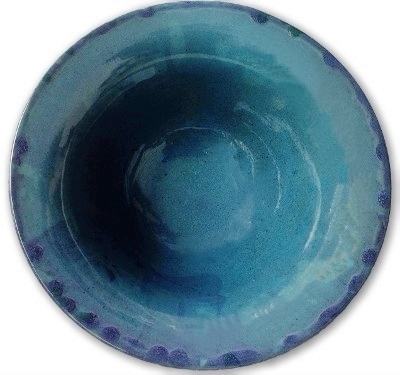 SATURDAY EVENING GIRLS matte blue bowl by Eva Geneco. S.E.G. mark and the cipher intertwined EG for Eva Geneco. Measures 8 1/2" across 2 3/4" high. No chips, cracks or repairs. S.E.G. 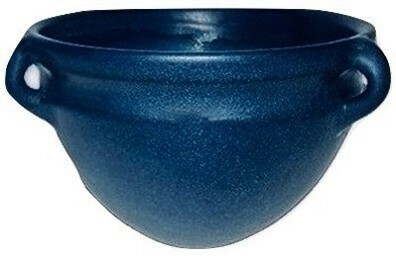 SATURDAY EVENING GIRLS large dark blue bowl with a lighter blue interior glaze. S.E.G. partial paper label mark is intact and the item is most likely signed S.E.G and the artist initials under the original label. Measures 8 1/2" across 2 3/4" high. No chips, cracks or repairs. >Saturday Evening Girls. 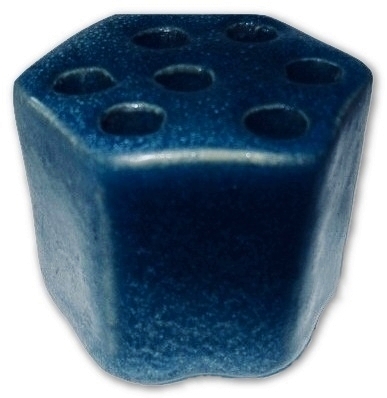 Measures approximately 10 1/4" x 4 1/2". SATURDAY EVENING GIRLS (SEG) dated 4-15 six sided blue flower frog. Measures 1 1'/2" X 2". There is a small stilt pull behind one of the little feet from the manufacturing process as it is lightly glazed over. No chips, cracks or repairs. Saturday Evening Girls (S.E.G.) yellow, white and black lined plate decorated by Sara Galner. Marked on the reverse S.E.G. 5-21 along with the artist's mark. Measures 7 1/2" across. 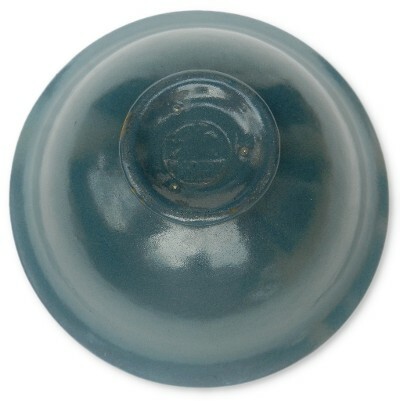 There is an area of glaze crawl on the face of the plate. No chips, cracks or repairs. SATURDAY EVENING GIRLS (SEG) INCISED RABBIT I.C.A. 6 1/2" plate. Decorated by FANNIE LEVINE and signed with her cipher and dated 5-19 standing for MAY 1919. This item has no crazing, no damage and no condition issues. Measures 6 1/2"" across. SATURDAY EVENING GIRLS (SEG) INCISED RABBIT I.C.A. 6 1/2" plate. Decorated by SARA GALNER and signed with her cipher and dated 5-19 standing for MAY 1919. This item has no crazing, no damage and no condition issues. Measures 8 1/2"" across. 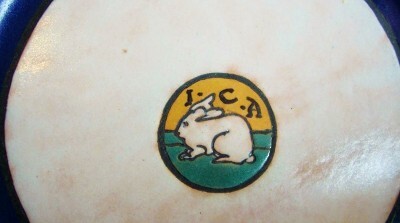 SATURDAY EVENING GIRLS incised rabbit I.C.A. 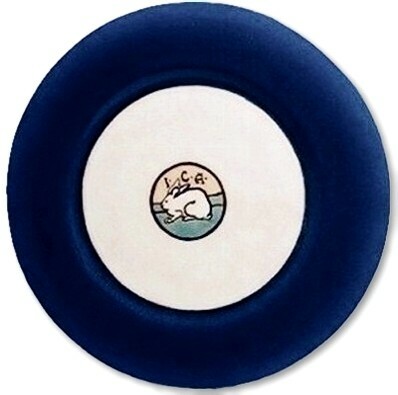 blue and ivory platter. Decorated by FANNIE LEVINE and signed with her cipher and dated 5-19 standing for MAY 1919. This item has no crazing, no damage and absolutely no condition issues. Measures 9 3/4" across at the widest point and sitting 1" high on a flat surface. SATURDAY EVENING GIRLS S.E.G. 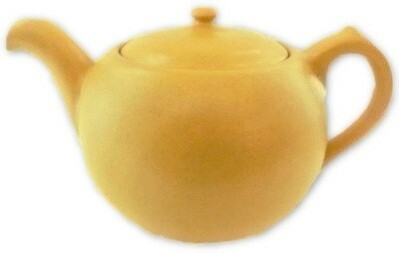 buttercup yellow matte glazed tea pot. Marked S.E.G. 1-22 along with an unidentified artist mark which appears to be a conjoined EO. 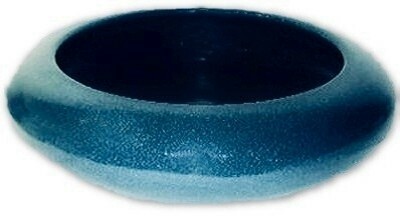 The underside of the lid has a section where the glaze appears to have stuck to the pot rim and not fully adhered. Measures 10 1/2" from spout to handle X 6 1/4" X 5 1/2". Other than the noted glaze skip, no chips, cracks or repairs.